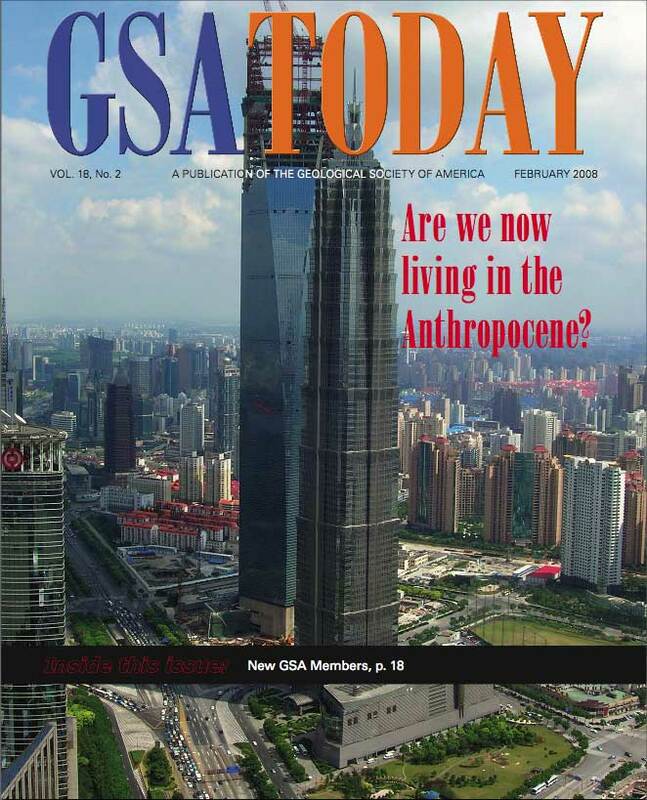 Posted by Jill S. Schneiderman in "Eaarth", Anthropocene, Bill McKibben, geologic time. In her recent piece in Yale Environment 360 “The Anthropocene Debate: Marking Humanity’s Impact,” New Yorker staff writer Elizabeth Kolbert addresses cogently the official reflection among my colleagues in the geological community regarding the possibility of crowning the geological time scale with a new name to characterize this age on Earth. Kolbert explains that the International Commission on Stratigraphy—the scientific group that minds geological time by tracking discoveries that effect the perceived location of Era, Period, and Epoch boundaries of the time scale—is taking seriously the question of whether or not to dub this geological moment on the planet the Anthropocene. Nobel prize-winning chemist Paul Crutzen and Eugene Stoermer, an expert on ubiquitous microscopic algae (diatoms) used to study environmental change, proposed the designation at the turn of the millennium in the newsletter of the International Geosphere-Biosphere Programme. By their report, since all components of the earth system (atmosphere, hydrosphere, biosphere, and rock sphere) had been changed, and would continue to be changed on global scales by human activities, an important step towards a maintaining a livable environment would be to acknowledge with nomenclature this fact. When I served on the Council of the Geological Society of America, I was glad to learn that the wider geoscientific community was considering this action. But regardless of the results of the deliberations that Kolbert details—ones that will be difficult because, as Kolbert aptly points out we geologists designate periods of geological time on the basis of fossils enclosed in sedimentary rock strata that mark the extinction or new appearance of life forms—I believe that humankind can’t wait for the slow wheels of science to dub formally this new time period. Regardless of whether the legend of the Roman emperor Nero is true, this contemplative mode could be perceived as the geoscientific community fiddling while Rome burns. Indeed, in the past when geologists have worked to parse earth history into discreet episodes, extended debate perhaps arising from our understanding of deep time has characterized our thinking. Resolution of the Devonian controversy in which members of the London-based Geological Survey, Adam Sedgwick, Roderick Murchison, and Henry de la Beche argued over the disposition of sediments in Devonshire took years. In fact, in his newest, no-nonsense book Eaarth: Making a Living on Tough New Planet, Bill McKibben, author of more than a dozen books including The End of Nature (1989), perhaps the first book for the layperson about climate change, and founder of 350.org, the grassroots global warming awareness campaign, avers that we have passed through the geological moment in which Earth has mutated into Eaarth, a planet “not as nice as the old one” but one on which we still have to live. Though he doesn’t name it as such, McKibben rightly asserts that we have moved from The Holocene Epoch—the most recent 12,000 years since the Earth emerged from the last major ice age—into Crutzen and Stoermer’s Anthropocene. Of all the ideas I hope my geology students will grasp, the notion that humans have acted as geological agents at non-geological time scales is most important to me. Though I will watch with interest the attempts of my scientific community to codify and articulate the scale of contemporary global change, I feel comfortable calling this new Epoch the Anthropocene. Here’s why. Earth formed approximately 4500 million years ago, also known as 4.5 billion years ago. It’s difficult to get a good sense of this length of time but it is critical to the project of grappling with the reality of the Anthropocene Epoch, whether officially recognized or not. As all geologists know and as John McPhee following David Brower popularized, using a calendar year as a metaphor for the 4500 million years of Earth history and employing January 1, New Year’s Day, as the Earth’s birthday, it’s possible to calculate the location of any calendar date in an Earth Year and detail the life and environment that existed at that moment in Earth history. “This Date in the Earth Year,” my name for this mental accounting, can help others develop an informed opinion on the issue of the Holocene/Anthropocene boundary. For example today, May 17, is day 137 out of 365 days in this (non-leap) year. With approximately one-third of a calendar year having elapsed, one might think that at this point in the Earth Year, some pretty complex organisms might have been roaming the planet. Not so. In geologic time, May 17 represents 2811 million years ago, the Archean, when the only living things around were bacteria and the atmosphere was rich in methane and ammonia while oxygen poor. Skip ahead to September 14, day 257 of 365; this date in the Earth Year brings us to 1330 million years ago, the Proterozoic —the second of the two eons that comprise the immense stretch of time called the Precambrian. Many of the most important events in earth history took place during the Precambrian including not only the formation of life, the accretion of the earth’s first tectonic plates, and the evolution of eukaryotic cells (single-celled organisms with internal organization). Still, at 1330 million years—the middle Proterozoic—the only living things on Earth were ocean-dwelling single-celled organisms. It took hundreds of millions of years but single-celled oceanic organisms changed the composition of the atmosphere so that by this point in the Earth Year, there was enough oxygen to cause iron to rust. Fast-forward to November 10, day 314, approximately 629 million years ago. You think, “Ah, now we’re getting somewhere.” But that puts us only in the Vendian, the latest portion of the Proterozoic eon. Still, some rocks of this age, known most famously from the Ediacara Hills north of Adelaide, Australia, contain the earliest clear fossil evidence of multicellular animals; they indicate that these organisms, for the first time in earth history, have become a significant life form. Spindle-shaped, long and pointed at both ends; branching, tree-like or network-like structures; large, round, disc shapes; lumpy cabbage-like figures; and, frond-like leafy forms. The Ediacaran fauna was large and flat with lots of external surface area; their relation to younger life remains obscure. As a result, some paleontologists assign them to a completely separate kingdom of multicellular life. “When do we get to us?” you ask. Well, November 17, day 321, marks the beginning of the Paleozoic Era when hard-bodied multicellular life began to proliferate and flourish. (Note that geologists also have debated the character and timing of this major boundary of the geologic time scale). But the entire Paleozoic Era, with its trilobites, brachiopods, and first land plants and animals is over by December 11, day 345. That’s 247 million years ago and we’re into the Mesozoic Era, the familiar age of dinosaurs. The Cenozoic Era began 65 million years ago on December 26. The Pleistocene, the epoch known as our most recent icy past—that which preceded the Holocene (now retired from my lexicon of the present)—occupies the waning hours of December 31. And that’s when we arrived and rapidly enriched Earth’s atmosphere in carbon dioxide, built mountains out of garbage, acidified the oceans, and melted the cryosphere. Whether we place the Anthropocene’s beginning with James Watt’s invention of the steam engine in 1784 or the first atomic tests in the 1940s, we might well apply Henry de la Beche’s words from the Devonian controversy (as quoted by historian of science Martin Rudwick): “Let us hope that the day is past when preconceived opinions are to be set up, as good as arguments, against facts; because if they are, let that fact at least be clearly understood.” In our short tenure on Earth, we geological latecomers have swiftly and profoundly altered the planet. As McKibben asserts and Kolbert reiterates, we have built a new Eaarth. Like changes marking other divisions of the geologic time scale, whether tectonic, climatic, or organismal, Eaarth differs enough from Earth that we might as well acknowledge a new time as well as a new place. Jill, again, right on the money! I especially like your take on the near-glacial (like my geologic simile :)?) pace of science, while Rome burns. I am going to have to plagiarize this idea. I always appreciate your comments and feedback.